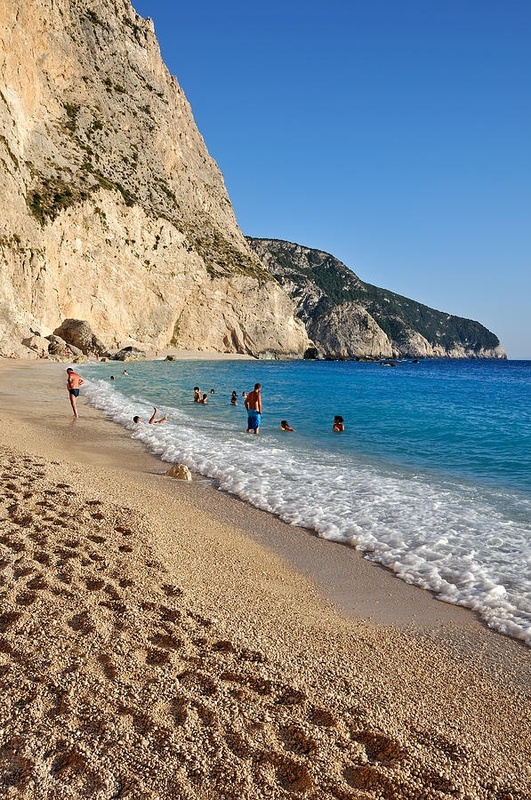 Porto Katsiki on the Ioanian Sea island of Lefkada is one of the most famous beaches in Greece and Europe in general. Translation to English means "Port of the Goat", because before only a goat could reach this area. A very famous and photogenic beach, it is at the bottom of an arc of pale cliff that seem to have the clean lines of something designed by an architect rather than a natural wonder. It rises out of the water like a wedge, narrow at the center of the bay where there are only a few stairs to the sand, and then towering upwards at either end. As well as the white lines of the cliffs, the water is bright, bright blue and the cliffs have grassy topped fringes.